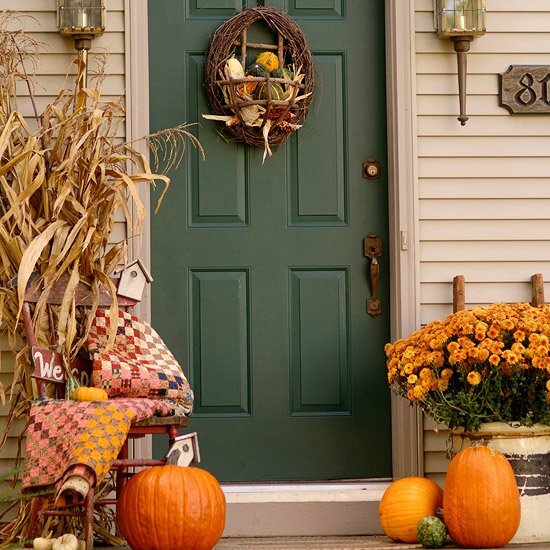 Today, we are going to present an awesome collection of front porch decorating ideas that will bring a total transformation to the way your porch or veranda looks this fall season. Yes, dear readers, you have entered the beautiful season of fall and now is the time your verandas or front porches appear stylish in every possible way! When planning to renovate your homes, do try not to ignore your front porches as these are entry points to your homes and as such, must look gorgeous and well kept all round the year. Read the post today that lists down the top 21 front porch ideas and see how amazing the exterior of the homes look! 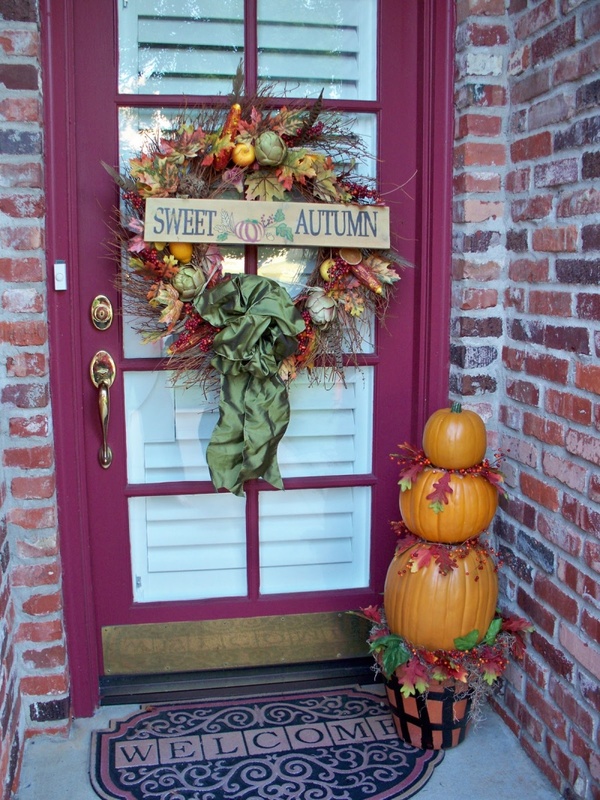 Fall is a season which is loved by all and one can use myriad front porch decorating ideas to decorate front porch of his or her home depending on personal likes and whims. 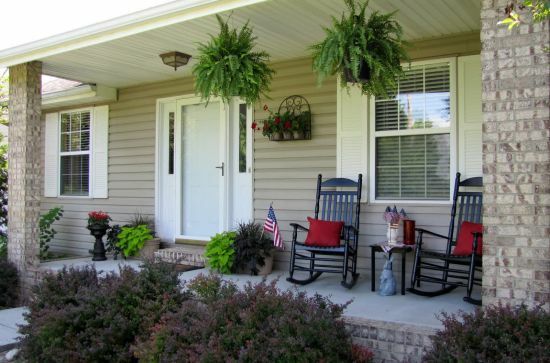 The image below shows a simple front porch that has been decorated on minimalist lines with classy looking wooden rocking chairs, pots of fresh green plants and flags. The grey and white palette combo adds to the elegance. The main highlight of the below showcased fall front porch is its beautiful wreath made of brown twigs, filled with pumpkins and gourds. The bright yellow mum flowers match effortlessly with the green colored door and white walls. 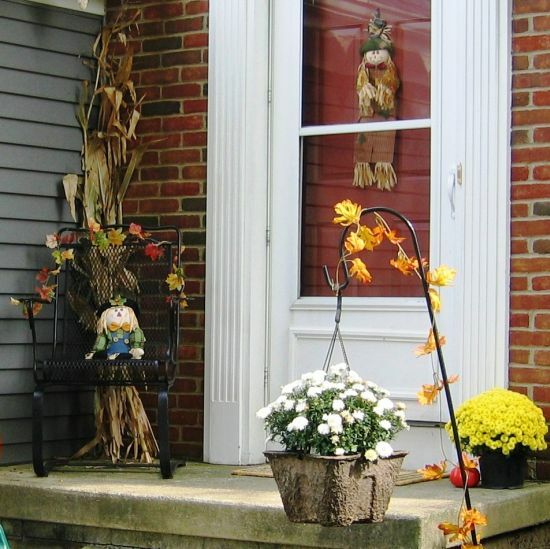 Yellow pumpkins and cornstalks add to the feel of the festive season and blend easily with the fall theme seen splashed all over the front porch. If you wish to decorate front porch on rustic lines, there are umpteen front porch decorating ideas available on the net that can help you. The front porch below has been set up with dry stalks of corn and hey bales, lending a rustic touch to the front porch decor. 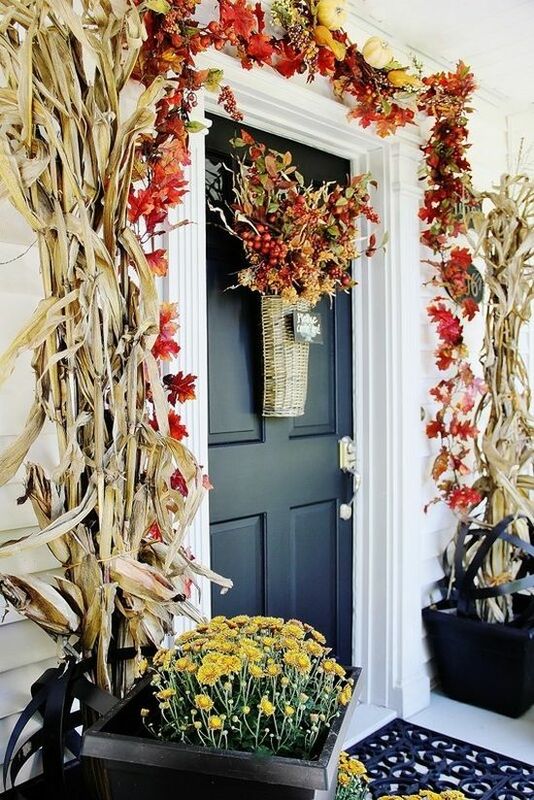 There is a colorful wreath seen placed on the door, while the side walls have been decorated with dry corn stalks. Other features seen here are flower filled urns and hay bales. 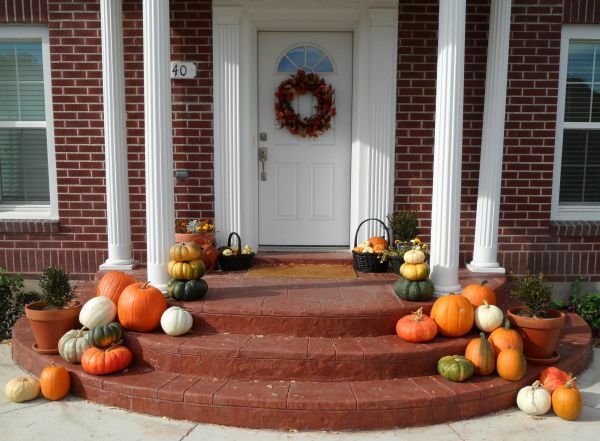 There are ways and means of decorating front porch using easily available materials like pumpkins, hay bales and cornstalks that are usually sold at every shop all throughout fall. 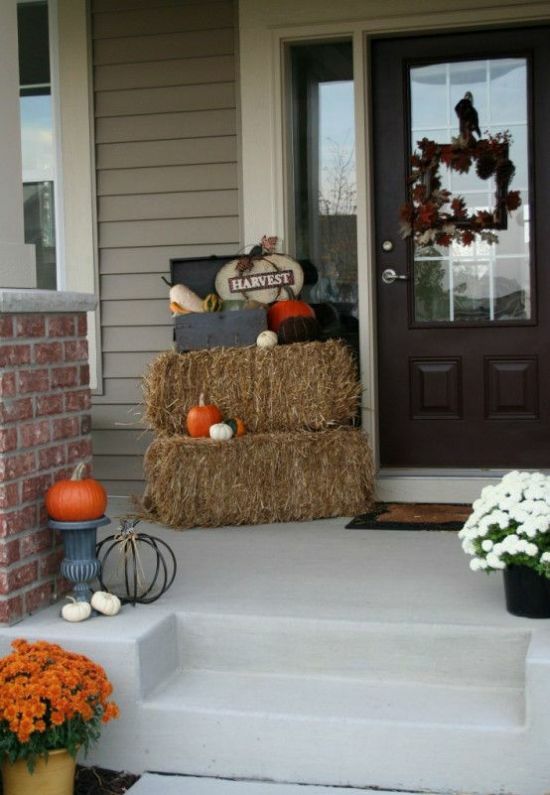 Seen below is an elegantly decorated front porch that has a perfect fall feel to it and we do get glimpses of cute little pumpkins seen arranged at various places along with colorful mum flowers, wooden pots, hay bales and cornstalks. Wreaths and lanterns dominate any fall decoration and the image below is no exception. When you have to decorate front porch using these two pieces, try to focus all the attention to the entrance of the house like the door and the sides of it. This will ensure that your front porch looks well lit up when the stars come out in the sky. The front porch seen below looks gorgeous with green wreaths adorned on the door, tied together with a red ribbon, and two pots with black antique lanterns arranged on the sides that offer an illuminating effect to the front porch decor. If fall is here, how can you not have orange accents splashed all over your front porch? If you like little vibrancy on your porch, you must place bright orange pumpkins and floral arrangements to bring out the festive mood in your home. The porch of this house looks amazingly classy with colorful pumpkin decorations all over along with a beautiful wreath and baskets. Who doesn’t love smiling pumpkins? If you love this veggie that is most synonymous with fall and all the festivals associated with it, then here is presenting a very chic looking front porch decor idea that utilizes pumpkins in a unique way. The pumpkin figures can be seen placed here and there along with yellow flowers and real pumpkins on the floor. Front porch ideas with floral arrangements and pumpkins are commonly seen around the world but these do look awesome and very colorful indeed. Seen hanging on the brick wall is a cute hanging pumpkin doll and on the floor are placed pumpkins of various shapes and sizes. 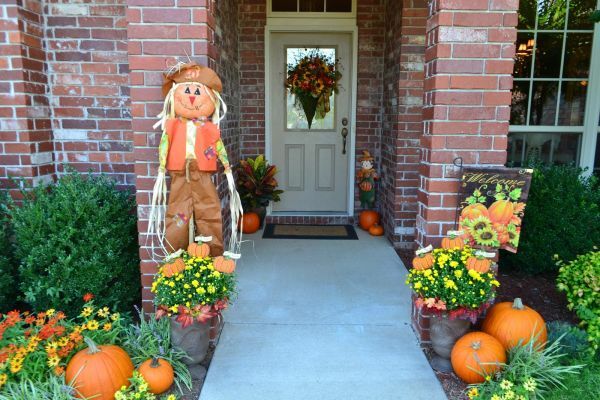 Front porch decorating idea such as this one is very popular all over. Look below to get some cool decorating ideas for fall wherein you get to use stuff that’s readily available in your homes or garages. Yes, go the DIY way if you want to spend less but do not want to compromise on style. 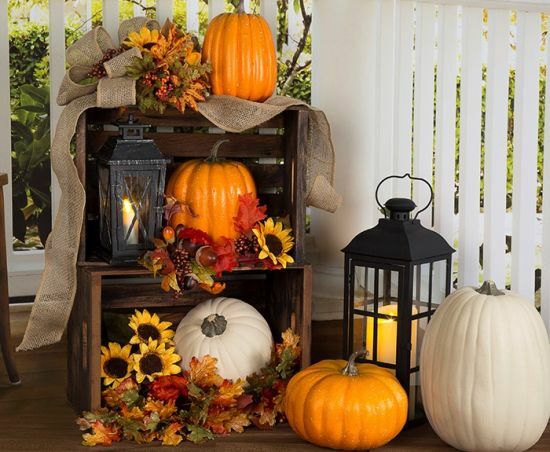 From burlaps to wooden crates to real pumpkins, you can use a whole lot of materials for creating a beautiful fall porch decor. A big wreath on the front door of any home looks grand, specially during fall when festivity is just around the corner. In this list of awesome decorating ideas for fall, you will probably fall in love with the white pumpkin decoration that can be seen in the image. The burlap bows look elegant and add a rustic look. 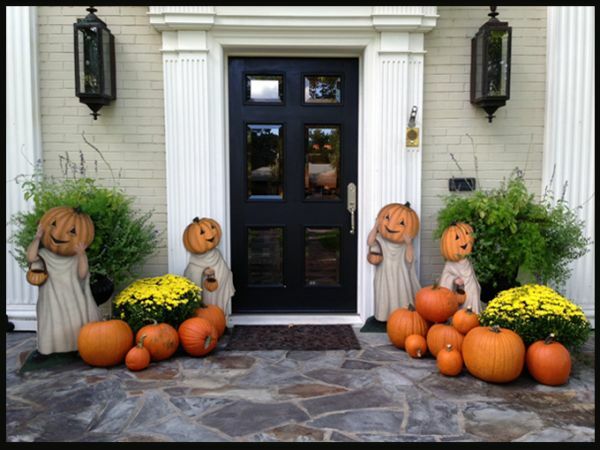 If its fall season, and you are planning to decorate front porch, there is no better way than to adorn the area with black lanterns with candles and pumpkins made out of cane, bamboo or real hay. 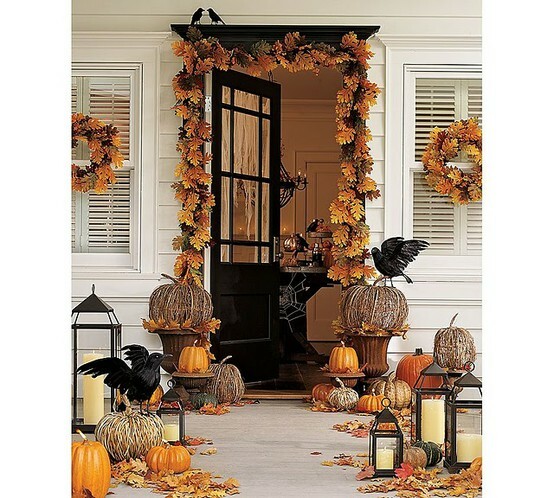 The fall leaves hanging seen on the door adds to the festive mood and the crow figures add a spooky feel to the decor. If you are looking for halloween decorations, just use front porch ideas like this one! The green wall cupboard, the green colored table and green flower pots in the image below looks very pleasant together with pumpkin arrangements seen all over. The colorful flowers too add to the beauty of the front porch. If you want natural elements to dominate your porch area, try decorating front porch with loads of plants and mum flowers. Fall bouquet seen adorned on the front door of the porch looks amazingly beautiful and the best part is that you can use dry real fall leaves and flowers to arrange them into a lovely bouquet. The dry floral bouquet looks very festive and gels well with the corn stalks seen placed on either sides of the front door. Fall decorating ideas with pumpkins is a time tested formula for most people as pumpkins are easily available everywhere and come at cheap prices. 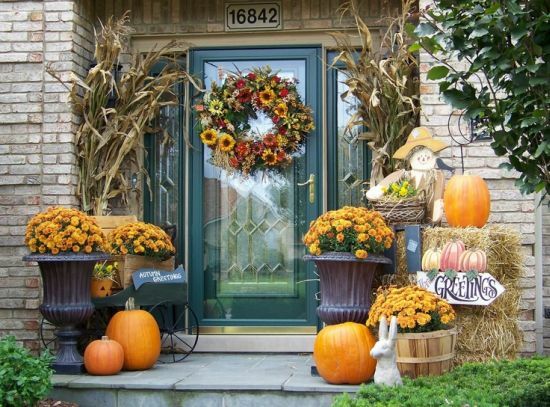 Pumpkins when coupled with wreaths also lend a classic touch to any porch decor just like the front porch that has a pot that’s decorated with three tier pumpkins and a wreath that has artificial fall flowers and leaves. 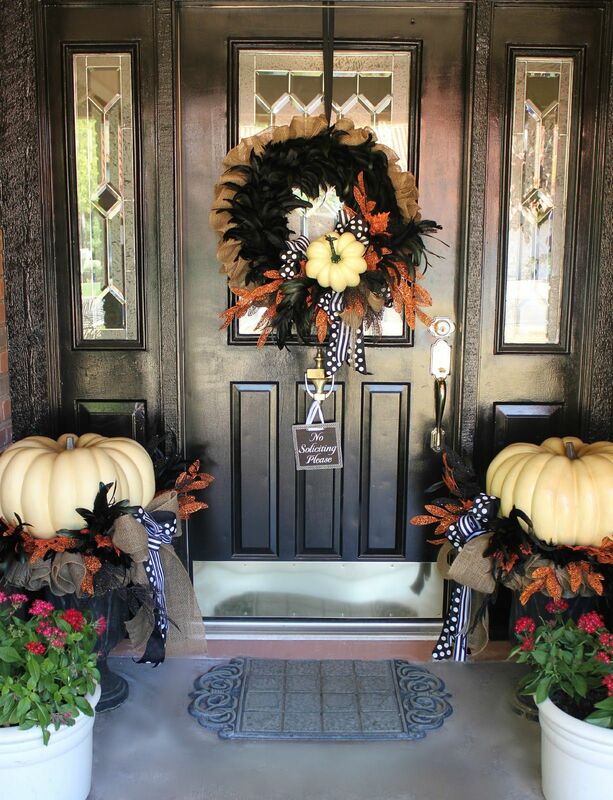 Decorating front porch with a halloween theme is popular as halloween is a festival everyone loves! 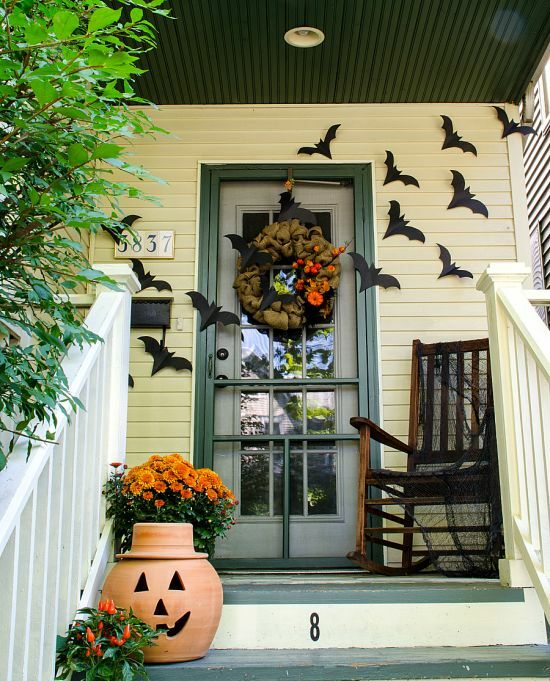 The front porch in the image below has been bedecked with as spooky decor dominated by flying black bats, a Jack O Lantern terracotta pot and a rocking wooden chair with a black draping, adding more to the spook factor. 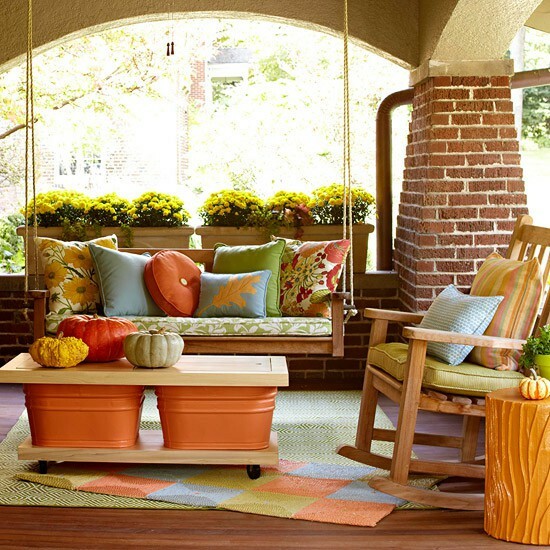 Front porch ideas making use of pumpkins might be seen on porches of almost every home, but when you couple it up with elegant furniture like the one seen below, your front porch transforms into a chic resting place as well. The colorful pillows seen are imprinted with fall leaves, and the coffee table has pumpkins as centerpieces. One can also spot bright yellow flower arrangements at the back. 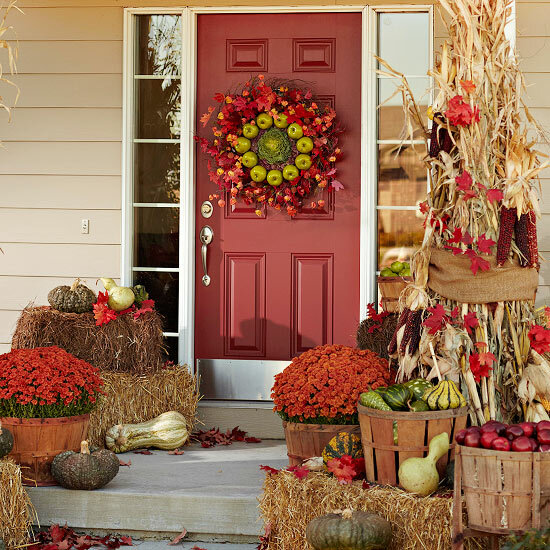 Seen in the picture below are fall decorating ideas that can bring cheer and festive spirit to your front porch. 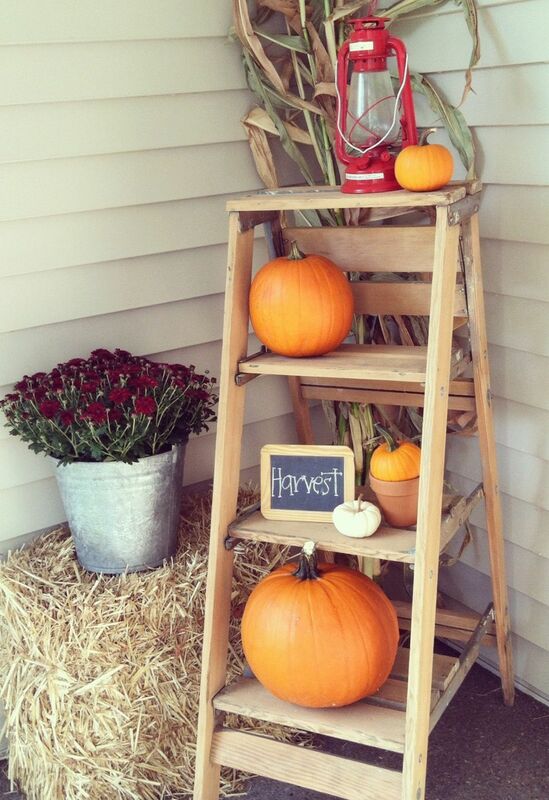 The ladder is seen decking up the porch area with pumpkin arrangements and a beautiful red lantern placed at the top. Seen alongside the ladder is a stack of hay bale adding more to the rustic charm of the porch. Are you planning on decorating front porch with a fall themed decorating idea? 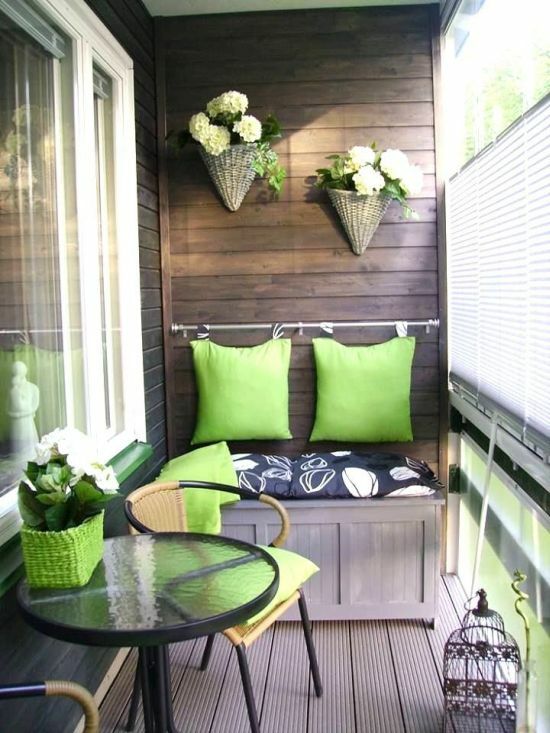 If so, its a good idea to use a blend of hanging floral basket, some corn stalks and some furniture like the black chair seen below. The corn stalk is placed on the side and there is a beautiful floral basket with white flowers that enhances the festive spirit. Front porch decorating ideas needn’t always be flamboyant with over the top decorations. They can always have an element of DIY if you do not want to spend big. Materials like crates, hay bales or pumpkins can add to the festive cheer and are pretty economical as well. 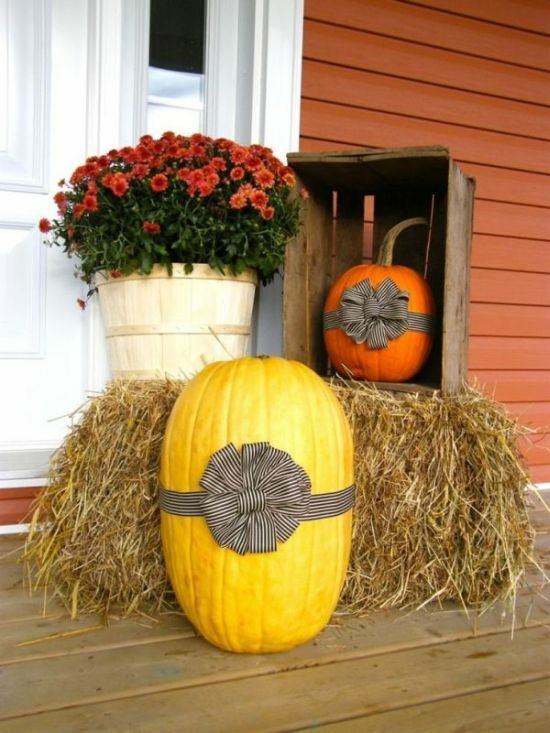 Hay bales and pumpkins seem to dominate any fall themed decor and here too, you would spot the front porch that’s been decorated with two bales of hay, some orange pumpkins, an old suitcase with gourds and a placard bearing ‘harvest’ that is arranged over the hay bales. 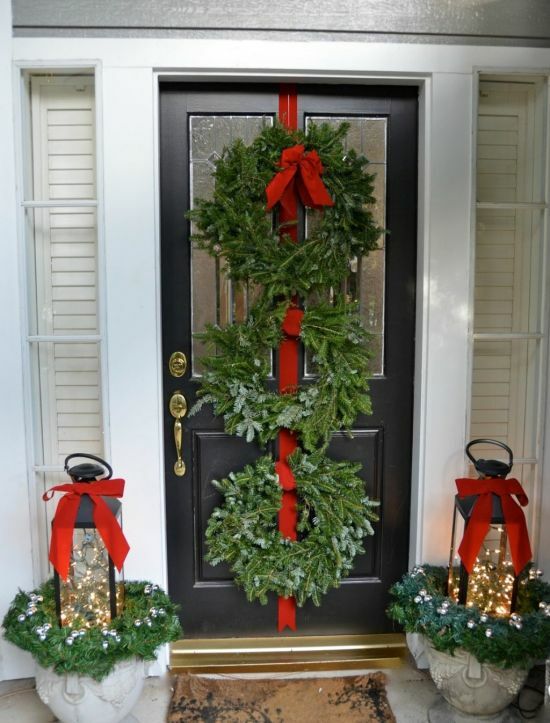 The wreath seen hanging on the door looks amazing too. Green looks classy and brings in lots of freshness to the front porch’s decor below. Green accents can be seen splashed all over, on pillows, and on basket placed on the table. The cane floral baskets hanging on the wall look stylish. Decorating ideas for fall with bright colors like green, enhance the look and spread cheerfulness all around. 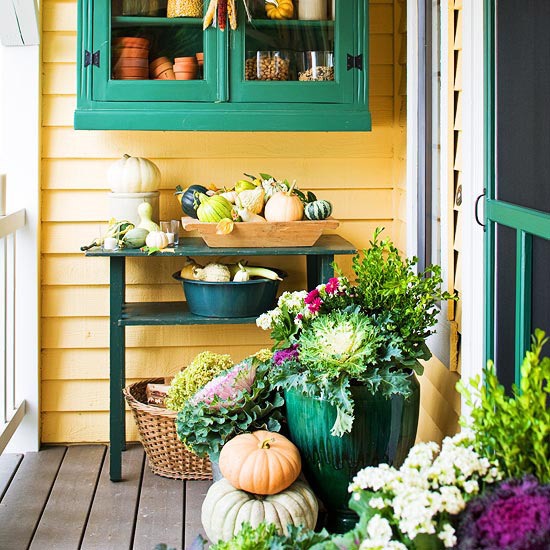 With these stunning 21 front porch decorating ideas for fall, you can march confidently ahead and bring total transformations to your outdoor decor. Fresh or dry floral arrangements or pumpkins can be seen dominating most of fall decorating ideas for porches and simply rock the outside of your homes. Look at these cool front porch decorating ideas and inspire yourselves to no limits!